The Visigoths were a part of the Gothic tribe; they left Scandinavia and settled on the Baltic coast of what is nowadays Poland. Tacitus, a historian from the first century, mentions a tribe of Gotones, which settled the lower Vistula region. In the second century AD a fraction of Goths, known as the Visigoths (Western Goths), migrated over the Dniester River to the Black sea. 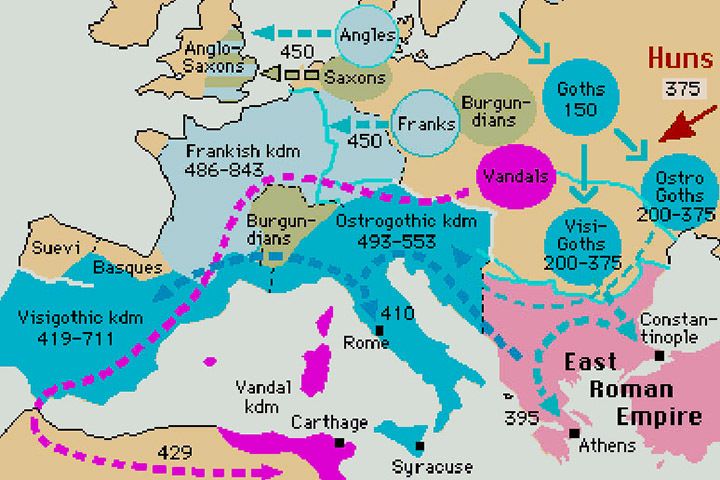 The Visigoths would in the future cross the borders of the Roman Empire and they would raid Roman provinces. In the second half of the fourth century a large portion of Visigoths, fearing the Huns, asked the western Roman emperor Valens (364 – 378) for the right to settle on Roman territory. They were allowed to settle under the condition that they give up their arms. They settled in the region of the Thracian diocese. But the Goths were mistreated by the Roman administration. For example, the prizes of food were enormously high for the Goths. The discontent Visigoths were arming themselves. They rebelled in 377 under the leadership of Fritigern. The Romans, who were led by the emperor Valens, were defeated in the famous battle of Hadrianopolis 378 AD. Since Valens was slain in this battle, the western Roman emperor Gratian (375 – 383) named Theodosius (379 – 395) as his successor. In spite of Theodosius’s abilities, he was young and a good commander; there was soon no possibility of conquering the Visigoths by force. Therefore, he formed an alliance agreement with them in 382. According to this agreement they were tasked with serving in the Roman army for a yearly wage. They formed separate units under the supervision of their leaders. The Visigoths were Roman allies (foederati) who were settled in the territory of the Empire. The Visigoths stayed loyal to Rome until the death of emperor Theodosius. Theodosius was able to unite the whole territory of the empire. But he decided to formally divide the empire into two parts: he gave the eastern part to his son Arcadius (395 – 408), and the western part was governed by Honorius (395 – 423). The Visigoths did not feel responsible to honor the agreement and further serve the Romans after the death of emperor Theodosius.